We are currently in the age of the connected customer, with customer expectation increasing significantly in recent years. It isn’t about customer satisfaction any longer but rather about creating the most personalised, servitised experience possible.Most of our customers are connected to the internet constantly, often on multiple devices. In the world of Uber, Amazon Prime, Just Eat and more, the connected customer will drive innovation and change among businesses and those who don’t adapt, will fail. Whilst our customers are connected, our businesses are not. According to Forbes, 2017, 73% of all people point to customer experience as an important factor in their purchasing decisions, just behind price and product quality. Today’s customer is demanding and expects your business to be one step ahead in the customer journey, anticipating needs and wants before the customer expresses them. Customers expect a logical and cohesive customer experience and they expect the business to build a journey that makes sense to them personally. One of the great things about engaging with the new, connected customer is the sheer amount of data and feedback companies can collect, that reflect how an individual prefers to engage with their brand. However, many businesses that collect these large amounts of data are unsure how to use it in the most effective way. The problem with having so much data is that it tends to exist across multiple disparate systems making it hard to collect valuable insights. Understanding the data you have collected allows you to create a fuller and more comprehensive picture of who your customer is, what their preferences are, and what their history with your brand is; allowing support teams to provide the best possible service and your marketing department to cater to their buying patterns. This will enable better interactions, quicker time to resolution, more informed decision making and an overall improved customer experience. Action: Do an audit of your current data collection. What percentage are you leveraging? Which data is actionable, and which isn’t? With the right analysis, you will be able to better understand whether you need digital tools such as BI or IoT to help you visualise and action customer insights. It is important to note and understand that the connected customer wants to engage with a brand where, when and how they want. Offering a variety of engagement alternatives for your customers provides part of the solution, however, it is also important that support can be provided through the chosen channels. Technology cannot be an add-on, it needs to work in line with your customers and the processes that your business has in place. Action: Evaluate the channels you use to engage with your customers. Do you have an omni-channel customer strategy in place? Map your customer journey to an engagement model to ensure that you have the right engagement channels and tools across the journey. For instance, if you attract business best through Facebook, perhaps you should consider having a separate Facebook page for customer complaints and support. Your strategy will help you ensure brand loyalty and engage better with customers and prospects. Speed is crucial to improve the overall customer experience. Your business needs to work smarter and faster to meet the growing needs of your customers. Artificial Intelligence (AI) and Machine Learning (ML) are becoming progressively important to help brands develop and deploy exceptional customer experiences. For example, chatbots offload simple, repetitive queries and allow support teams to concentrate on complex, high-value interactions. There is room for chatbots and other easily scalable technology that provides personalised and tailored interactions. In the upcoming years we will start to see more voice activated chatbot-type technology that answers customer questions in the customer’s preferred way. Customers want to talk to businesses in real-time and businesses need to quickly adapt to meet this demand. Action: Ensure that your current customer engagement solution gives you the capacity to adopt new digital technologies such as AI and ML. Start with an omnichannel engagement approach and use the analytics to see where your business comes up short. Test AI and ML to fill these gaps using a small-scale roll-out approach. Thought Shift, 2017, has forecasted that B2B buyers are researching ½ of their work purchases online. The business buyer is already connected and expects your business to be connected as well. 65% of business buyers have stated that they are likely to switch brands if their company is not treated like a unique organisation. An example of a business that has implemented a seamless shopping experience for their customer is Just Eat. Just Eat provides the end consumer with the ability to order food from the comfort of home, creating a seamless experience that is easy to use. We can open the Just Eat app on our phones, tablets and desktops and easily sort by the type of food we want to eat; we even have the option to select a previous favourite as suggested by Just Eat. Without leaving the app, we order food and pay in one place. Just Eat provides a food tracker which provides us with real-time alerts on whether our food order has been received by the restaurant, what stage of cooking it is at and when it is out for delivery. As a user of Just Eat, we would never know that they are essentially classed as a broker for our local restaurants because from start to finish they provide us with a seamless process that is easy to use. This is the experience every consumer, B2B and B2C, now expects. Action: Ensure you provide a seamless online experience for your customers to shop. Your storefront, even for the B2B buyer, should proactively inform the buyer, with stock levels and delivery times updated in real-time, payment and invoice information automatically inputted, and all relevant instructions and warranties available and accessible. If this isn’t the case, you are missing out and should be re-evaluating your eCommerce strategy. All organisations will face challenges as the world becomes more connected and will have to make significant operation changes to their business model in order to thrive against rising competition. 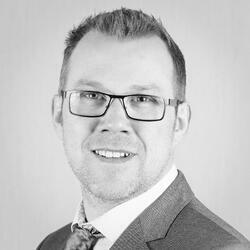 Over the last decade at Columbus Chris has developed key organisational strategy and built a team who are driven to help organisations succeed in their digital transformation and value realisation journeys. His guiding principles, which are continually developed and form the backbone of Columbus's ethos are as follows: • How can we take as much risk out of business solution projects as possible? • How can we do things that are effective and repeatable? • Are we always leading and challenging the Customer to make the right decisions? • Are we thinking people and process first - then technology? • How can I build a team of experts not generalists, and keep developing them? • How can we drive more efficiencies and streamline business processes? • How do we drive organic growth while engaging with customers in joint partnership for mutual success? As part of the Columbus UK Management Team Chris plays an active role in the growth and success of the business. As many of us wind down for the festive season, now is a great time to think about the maintenance of the systems your business relies on, and get organised for next year. Next year, we see new trends emerging including Evergreen updates for Microsoft Dynamics 365, so use the end of the year to ensure you are prepared for changes to come.